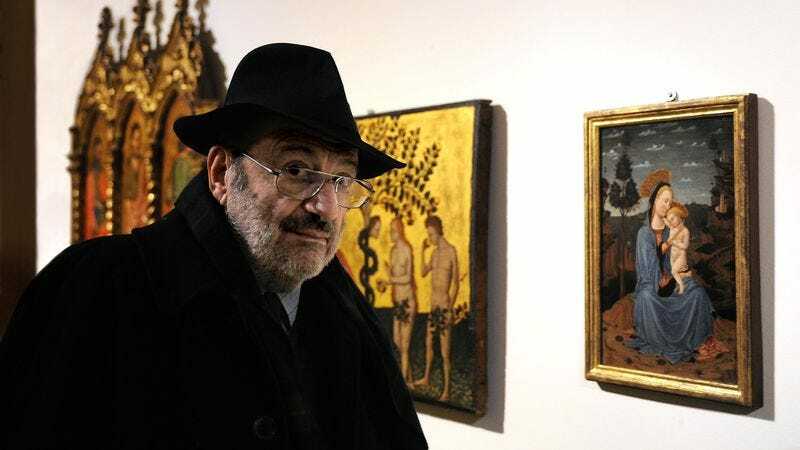 BBC News is reporting that Umberto Eco, a prolific author and academic best known for novels focused on introspective conspiracies, both large and small, has died. Eco, who published his seventh novel, the political satire Numero Zero, last year, was 84. Born and raised in Italy, Eco quickly established a reputation for himself as a theorist in literature and cultural theory, contributing major works to the growing field of semiotics—the study of signs and meaning—throughout the 1970s. In 1980, though, he made the move from literary theorist to literary celebrity, with the publication of his first novel, The Name Of The Rose. A cross between the detective fiction of Arthur Conan Doyle, the literary labyrinths of Jorge Luis Borges, and Eco’s own obsessions with medieval history, the novel—set in an Italian monastery where monks inexplicably begin to die—became an international bestseller. The book was adapted into a film version in 1986, with Sean Connery (accompanied by a bizarrely cast Christian Slater) playing Eco’s noble Franciscan detective, William Of Baskerville. Eco cemented his literary reputation eight years later, by following The Name Of The Rose with another dense but massively successful bestseller, Foucault’s Pendulum. Centered on a possibly real, possibly fake conspiracy constructed by a trio of bored literary editors, the novel is often considered to rank with Thomas Pynchon’s The Crying Of Lot 49 and Shea and Wilson’s Illuminatus! in the great works of 20th century paranoid fiction. Eco continued to write aggressively, in both fiction and non-fiction, for the next 30 years. And while his work never reached the heights of acclaim afforded to The Name Of The Rose, he was still capable of generating a periodic bestseller, as with 2010’s The Prague Cemetery. In his non-writing life, meanwhile, he continued to amass a huge library—which numbered as much as 50,000 volumes by the time of his death on Friday night—and serve in various academic posts, including professor emeritus at the University of Bologna, a position he held from 2008 until his death.